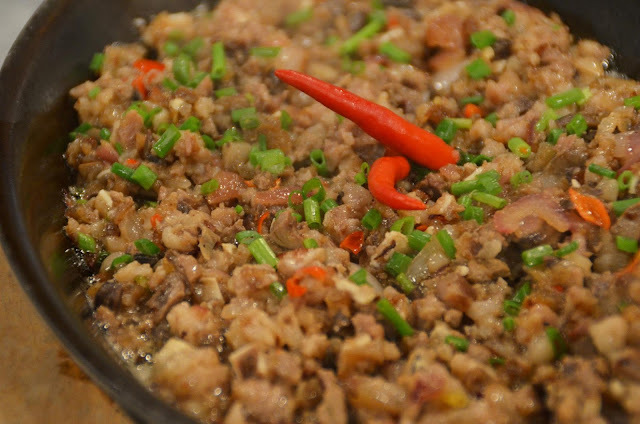 Astig na sisig is Chef Boy's very own take on the kapampangan classic. This dish has the familiar sizzle and succulence that stays in the heart long after every morsel has been wiped off the sizzling plate in which it comes. 1.Clean and wash well all meats. 2.Boil all meats until tender and drain. Broil in charcoal until brown. 4.Combine chopped meats with siling labuyo, onion, calamansi juice, and vinegar. 5.Season with salt, pepper and powder seasoning mix. Serve on a sizzling plate.